The victim was a PowerMac 9500 with a 300MHz G3 CPU, 200Mb RAM, a 9G HDD (with OS9 installed), and a 2G HDD (blank). I hooked up a PowerBook to see the serial console output, since OpenFirmware only talks over the serial line. Then I finally found floppy images that would boot actually boot. They were from Woody, so I did a netinst using boot-floppies. Unfortunately the Linux didn't come up after reboot. After resetting the nvram I could at least boot MacOS again and then start Linux via BootX. It took quite some fiddling with quik and the nvram till I had the direct boot working. Subsequently I upgraded to etch, but I couldn't get a 2.6 kernel to boot. First I got a bus error from the IMS TwinTurbo graphics card driver, then the kernel "forgot" where the initramfs was loaded, which turned out to be a grave bug in the Debian kernel images (#366620). I wrote patches for both bugs and now I finally have Etch with Linux 2.6 working. Whee! When writing manual pages the question comes up when to use "-" and when to use "\-". The answer is actually quite simple. Use "-" whenever you want a hyphen and "\-" when you want a minus sign. There are two exceptions though: In the name section, "\-" is used to separate program name from short description, as in "man \- an interface to on-line manuals". The other exception is that you have to use "\-" for options/switches (-h, --foo, etc.). "\-" causes man to emit an U+002d Hyphen-Minus character, whereas "-" results in U+2010 Hyphen (in a unicode locale). U+2d is the normal ASCII hyphen char, the one programs use to test for switches. So "\-" allows copy&paste from the manpage, while "-" doesn't. Last monday I held a short talk about ELF objects and dynamic linking for the Debienna crowd. It went semi-well; people were quite interested but somtimes didn't seem to grasp what I was talking about. Which was probably my fault because I didn't spend enough time preparing the talk, being on a difficult subject to begin with. Perhaps I'll talk about the subject again for maks, Rhonda and baumgartner (if they are still interested), since they weren't able to attend. In case anyone cares, I've written up some notes about ELF, dynamic linking, symbol lookup and related stuff, covering most the thinks I talked about. I needed to fix the elfutils build failure on ia64, but I didn't have access to such a machine. Fortunately Herbert Pötzl pointed out ski, an ia64 emulator for Linux. Ski needs a custom guest kernel however, so I had to cross-compile that for ia64. Setting up a cross-compiling toolchain on Debian is really easy nowadays; there's even a nice HOWTO describing the needed steps. For lazy people pre-built packages are available. When compiling the toolchain yourself, note that you may need more/other library packages then listed in the HOWTO. This depends on the target architecture, e.g. for ia64 you will need libunwind7-dev, libatomic-ops-dev, and further libc6.1 instead of libc6. Otherwise gcc will complain about missing build-dependencies. For ia64 I ran into a linker error when building gcc, however a patch from Bertl's cross-compiling corner solved that. While doing all this I wrote some scripts to automate the process, so compiling a cross-toolchain (for any architecture) is now a matter of 5 minutes configuration and one ./driver run. Whee! In the past I needed to move old mails out to a backup folder occasionally, since it took too long for mutt to load all the headers when opening the maildir (often some 10 seconds for about 6000 mails). Mutt can actually use 3 kinds of database backends for the cache, bdb, gdbm and qdbm. The default in Debian is bdb, to use one of the others you have to flip a switch in debian/rules and recompile the package. On my machine qdbm was fastest (gdbm slightly slower, dbm far behind), so I stuck with that. Since I use a self-compiled mutt package anyway (because I want my index_color patch included), it's not much of a problem. The goal is to automatically synchronize files between several hosts without compromising the integrity of the separate machines. A nice tool for 2-way sync is unison. To sync files between different machines The Right Way (TM) is to tunnel the unison protocol over ssh. This is well supported by unison. To run sync automatically (e.g. via cron), you need to create an SSH keypair without passphrase, so unison can log into the other machine without human interaction. This is where the problems start, since anyone who got access to the private key (e.g. by compromising or stealing the machine the private key was on) can log into the other host. That way someone who has the private key can't execute arbitrary commands, but just unison in server mode. However it's still possible to tell the unison server to overwrite arbitrary files (which the user has write access to). This is a major problem, since also files like ~/.bashrc can be overwritten, so the next time the user logs in, arbitrary commands will be executed. One solution is to simply create a new user on the remote host with a disabled password, and let unison run as that user (via adding the appropriate line to $HOME/.ssh/authorized_keys, and telling the local unison to use that username). That's possible, but the .bashrc trick still works, it's just less likely that the code there is ever executed (root would have to use su to become that user). For me this solution didn't work out since I wanted to sync my maildir, and it was hard to ensure that file permissions were set in a way that both allowed me to read my mail and allowed unison (running under user unison-sync) to sync the files. All the problems vanish as soon as you run unison under the user you'd normally use, but in a chroot. Now a full-blown chroot takes up a lot of space, and there's once again the danger that someone might enter the chroot and run some kind of shell (though the risk is even lower). It's best to use a chroot which only contains the bare minimum of files necessary to run unison -server. No shell inside the chroot that would read startup files from $HOME. The zsh symlink is there because I have /bin/zsh as my shell in /etc/passwd, and dchroot also wants to use it in the chroot (for launching unison). /home/greek0/Maildir is bind-mounted from outside the chroot, bind-mounting is done at boot-time via /etc/fstab. The chroot was created manually, simply by copying the files from the host. You obviously need /usr/bin/unison plus all the libraries it depends on. You can find those via readelf -d /usr/bin/unison | grep NEEDED. Additionally you need the dynamic linker /lib/ld-linux.so.2 (seen from readelf -l /usr/bin/unison | grep INTERP -A 1). One thing to pay attention to is that most of the files copied from /lib are symlinks. Be sure to either use cp without arguments, or use cp -a and copy the link targets too. If you can just install Windows 95 inside QEMU and it magically works consider yourself lucky. I tried this and got an error message that I need to create a FAT partition first where the installer can place some files. That's where it all began. Create the disk image. dd if=/dev/zero of=hda bs=$(( 1024*1024 )) seek=1000 count=0. That way you create a sparse 1GB file. Get a FreeDOS Floppy and CD image and install FreeDOS inside QEMU, there you can partition your disk. qemu -hda hda -fda fd0 -cdrom cdrom-img -boot a. You need the Realtek rtl8139 driver, other network cards won't work (ne2000 at least doesn't). So run qemu with -net user -net nic,model=rtl8139. Windows 95 unfortunately doesn't have the driver for the rtl8139, so you need to get it onto the system. Download it from well, the Realtek driver download page. Unzip it, put it onto a floppy, create an image of that floppy and run qemu with -fda image. Then setup the networking under windows, reboot and you should be able to access the internet. 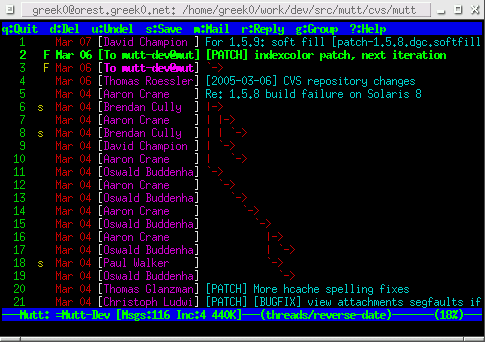 This is a tool that displays Debian bug reports in mutt. You can then directly read all messages sent to the bug and reply. The messages are fetched directly from the web interface, so there is no delay between requesting bug and getting it per email. This tool was originally written by Christoph Berg, I've made some modifications to make it work in arbitrary directories. gpg --verify is quite slow when you have large keyrings included (like the debian keyring). This is nasty, since mutt has to wait until gpg is finished when displaying a gpg signed message (with signature verification on). So I've written a tool that splits a huge keyring into a lot of smaller keyrings (one key per keyring) and a shell script to verify signatures, to be used from within mutt. The former tool is called splitkeyring.sh. The latter one is gpgverify.sh. gpgverify.sh first invokes gpg --verify as normal and captures its output. If gpg failed because the key was not found in any keyring, the script looks if the key is in one of the splitted keyrings, and if so, reruns gpg with that keyring included. Otherwise the gpg error is returned. These scripts are still hacky, if you want to use them you'll probably have to modify them a bit. They aren't too big, so this shouldn't be too much of a problem. This patch enables different colorings for different parts of the index display. For example you can choose one color for the subject, another one for the author, and a third one for the flags. Screenshot #2: Notice how messages written by me are differently colored then those from other authors. This is done using indexcolor's author pattern matching. mutt-1.5.12-indexcolor-3+cb.diff: indexcolor-3 forward-ported to mutt 1.5.12 by Christoph Berg. Thanks a lot! mutt-1.5.8-indexcolor-3.diff: Added pattern to index_author and index_color command. Documentation updates and some other fixes. This one is stable and has the biggest feature-set. mutt-1.5.8-indexcolor-2+cb.diff: -2 with additional fixes by Christoph Berg (thanks!). This one works really well. mutt-1.5.8-indexcolor-1.diff: First release of the indexcolor patch. It's undocumented and buggy. UpdateModDate.vim is a vim script I have written for updating the date-stamp of these pages automatically every time I save the files from within vim. I've hit a bug in vim related to html highlighting that would cause get really really slow. This has already been fixed though. The interested might look at the detailed description.